The biggest fight of all is with himself. Master Bua: Right now, an insane person like Mhen can understand the world better than a sane person like you. Mhen: Staying here is better than jumping. Tien: I'm at my wit's end. I'm alive, yet my life is worthless. Master Bua: You were born under an ominous sign that causes you much suffering. Mhen: But now, my name cannot help rectify my fate. I cannot accept life like this. I like Tony Jaa. I like most of his films. This one though was very bad. A waste of 130mins of my time. story was awful. not enough fight scenes which is the main reason for watching such films. the end fight scene was disappointing. 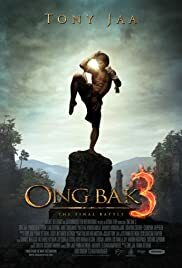 ong bak came out 7 years ago that and his other films were great. so sad because Tony Jaa isn't getting any younger and he wont be able to do these moves forever. To become a star in the US and Europe he needs to up his game on the usual knees and elbow moves and elephants while not making awful films like this. tick tock. A long wait for this film and I am very disappointed.